I was always taught that Israel wants peace. I started learning about the Arab-Israeli conflict at Yavneh, the pluralistic Jewish day school I attended growing up in Cincinnati. Peace was a Jewish value we prayed for in the Amidah every day. It was the 1990s, and the Oslo peace process was in full swing. There was a feeling of hope that the conflict was coming to an end. My generation would know only peace. My Hebrew teachers may have held a variety of opinions about the peace process, but to us they stayed on message: Israel wants peace. The conflict is political, not personal, they said. If the Arabs requested peace tomorrow, Israel would have to be ready today. Loving Israel didn’t mean hating Arabs. After graduating Yavneh’s middle school, I entered ninth grade at a public high school. My first new friend was Joe, whose parents had immigrated to the United States from Nablus in the West Bank. Joe was a Palestinian, I was a Jew—but we saw no reason not to be friends. My high school years, 2000 to 2004, were a tense time for anyone with an eye on Israel and the second intifada. Bombings rocked Israel; in retaliation, the Israel Defense Forces launched incursions into Palestinian cities. Israeli and Palestinian blood was spilled and hope evaporated. Still, Joe and I didn’t shy away from talking about the situation. When we did, we expressed mutual respect and understanding for each other’s grievances and a genuine desire to come to a compromise. After high school, I wanted to do my part to advance peace between the Arab world and Israel. For my junior year abroad while a student at George Washington University, I enrolled in study programs in Cairo and in Sharjah, United Arab Emirates. I was convinced that peacemaking required individual action on a one-to-one basis. I wrestled with revealing my Jewish identity to my classmates, fearing that if I didn’t, I would be lying—and that was not a foundation for building relationships. Still, I decided I would only tell people about my being Jewish if asked. Everyone asked, and usually it was the second or third question out of their mouths. I learned very quickly that in the Middle East, people are defined by their heritage, and that religion is the ultimate defining factor. When students found out I was Jewish, they looked at me with expressions of horror, hidden at best by forced smiles. In fact, genuine friendships developed out of those talks. 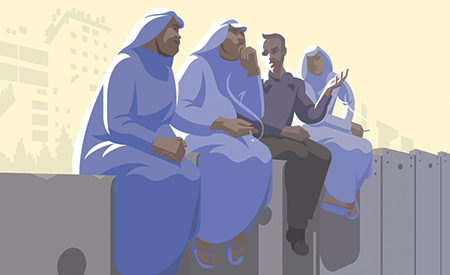 A clan of Emirati brothers informally adopted me and treated me like I was one of them. A Lebanese girl asked me for help with a presentation on the Hebrew language for a class project. I could cite many other examples of friendship. I doubt if anti-Semitism or hostility to Israel abated during my time in Cairo and Sharjah, but by the time I left, people told me that I was the “good Jew” they knew and cared about. People begged me “never to go back to Palestine” because they were concerned I would get hurt. I didn’t listen. After graduating from college in 2008, I made aliyah and joined the Israeli army. I used the Arabic I had learned to serve as a translator in an infantry unit, becoming the face and voice of my platoon during both friendly and hostile interactions with Palestinians in the West Bank. In the army, I was taught to treat Palestinians the same way I’d treat my grandparents. While there were militants who posed a genuine threat and had to be taken into custody, the vast majority of Palestinians I met just wanted to live in peace. After military service, I moved to Tel Aviv and forged a career in Israel’s high-tech sector. These days, my interactions with Arabs and the opportunity to speak Arabic are mostly limited to excursions to restaurants in Jaffa, and I regret that. Before the second intifada, there was a real push by Israel to promote peace by encouraging personal interaction with Palestinians. But the fear that arose from terrorist attacks and the military conflicts that ensued gave rise to the promotion of separation as a security measure. That is understandable, but I wonder if that policy in fact promotes less security, depriving Israelis and Palestinians of the relationships upon which a true and lasting peace can be built. Moving forward, Israel should do more to encourage cultural and commercial ties between Israeli and Palestinian civilians while upholding its commitment to security. I am convinced that engagement, not separation, is the only way to create a lasting peace. Michael Bassin is a partner at a Tel Aviv-based technology company. This article is adapted from his book I Am Not a Spy: An American Jew Goes Deep in the Arab World & Israeli Army (WiDo Publishing).